Experience Hazeltine Like Never Before, Ryder Cup. The time for advanced 360 fan experiences at live sporting events has never been better because of innovative technologies. Turner is capturing the 41st Ryder Cup tournament with their new “Hazeltine Explorer” banner providing unprecedented digital looks at more than 4,300 pictures of the pristine golf course located on over 160 acres in Chaka, Minnesota. Fans can take a virtual walk through the course in a first person, point of view (POV). This sports tech tool is available online at RyderCup.com and from the full suite of Ryder Cup apps. 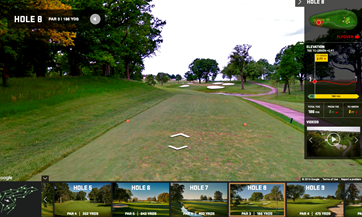 “Hazeltine Explorer” uses Google’s Street View Trekker technology to morph together each picture into an full interactive course tour. Viewers can enjoy features such as custom elevation graphs for each hole, historical moments created at this course and a responsive design sure to keep virtual spectators thrilled to be in control of their content delivery. Turner Sports partnered with Google’s Street View Tracker to invent this sports technology solution undertaking it’s inaugural use with professional golf. A human wearing a wearable backpack with a camera system mounted on top, strolled the entire course by foot snapping image after image collected from all 18 holes, as well as the clubhouse, practice driving and putting areas, and other significant places at Hazeltine. A total of 15 lenses on the Trekker each snapped unique perspective photos used to create the custom panoramic look. Pictures were taken automatically every 2.5 seconds. The images were then stitched together creating 360-degree panoramas users are familiar with on Google Maps. Google Maps API enabled a first of its kind, Wayfinding feature integrated seamlessly into the official Android and iOS applications allowing for course detail, information and routing instructions that take into consideration all walking paths and crosswalks to optimize directions for spectators. By using a customized map constructed specifically for the course layout, patrons in attendance can display on-course facilities and amenities saving time and making for an enhanced overall Ryder Cup fan golfing experience. 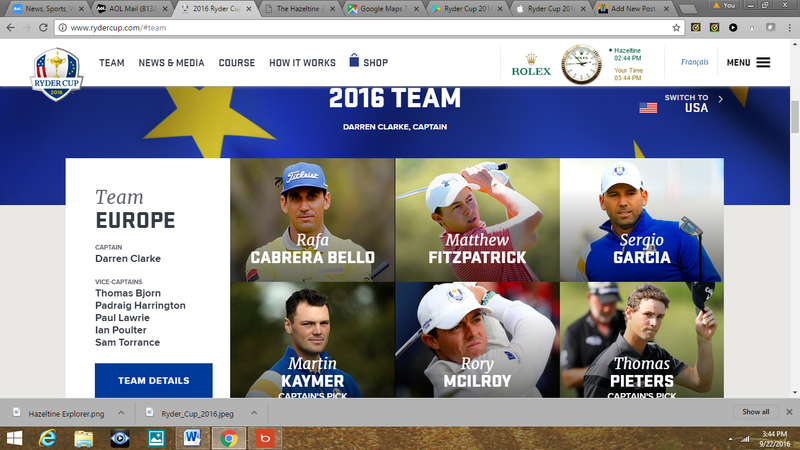 The RyderCup.com website is managed by Turner Sports in partnership with the PGA of America and the European Tour. 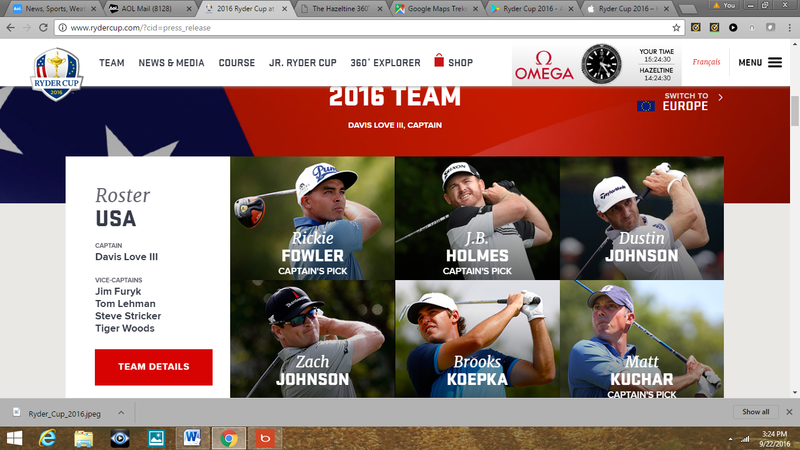 In addition to the new interactive software products, the site will provide comprehensive digital coverage with live video streaming of the 2016 Ryder Cup held next week from Tuesday, Sept. 27, through Sunday, Oct. 2. The Ryder Cup is played in even-numbered years between 12-member teams from the United States and Europe. It consists of five match-play sessions played over three days. “Hazeltine Explorer” to Offer Most Comprehensive and Immersive 360-Degree Photo Experience Ever for Professional Sporting Venue. The United States will have eight players determined by points, while the European Team will have nine – the first four coming from the European Points List and the next five from the World Points List. Europe has three Captain’s Picks, while the USA has four. Each of the first two days includes one four-match session of four-balls and one four-match session of foursomes. The final day is reserved for 12 singles matches. Each match is worth one point, with matches ending in a draw worth 1/2 point to each side. The first team to reach 14 ½ points wins the Ryder Cup. If the matches end in a 14-14 draw, the team holding the Ryder Cup retains it. 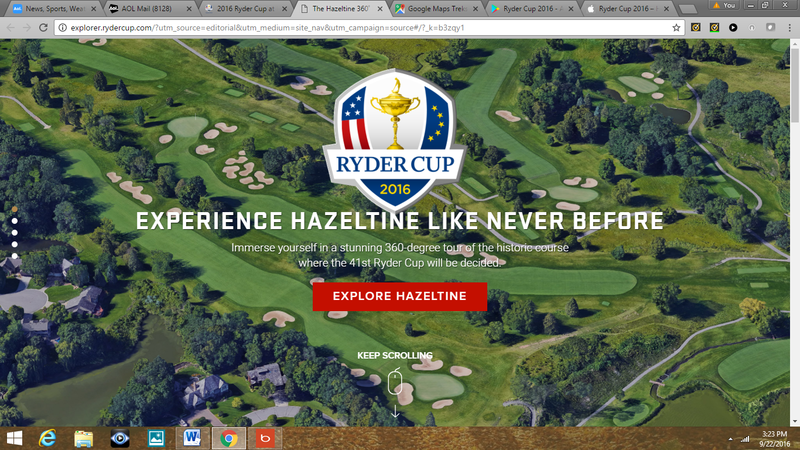 Ryder Cup Hazeltine Explorer Sports Tech By Turner Sports And Google Trekker Technology – #SportsTechie blog. Sports Techie, we live in a grand digital time for sports tech development. Turner Sports together with Google and Ubilabs are a perfect example of the what the union of sports and technology can mean for the sport of golf and a unique fan experience via the “Hazeltine Explorer” like no other. Who will be this year’s international Ryder Cup champion, Team USA or Team Europe? Will Team USA Captain Davis Love III use analytics to create the best match-ups as the European team has been successful with in the past? What shot with what club on what hole will be archived forever as the game-changer and bring back memories of Tiger Woods, Bernhand Langer and Y.E. Yang ? Who will lead their team to the coveted Ryder Cup trophy? Will Jordan Spieth, Rickie Fowler or Dustin Johnson for the US team, or Rory McILRoy, Martin Kaymer or Thomas Pieters lead the charge for the always tough European squad to a thrilling Ryder Cup championship at Hazeltine National Golf Club? Either way, enjoy the Ryder Cup digital products, in particular the mobile apps, Wayfinding and Hazeltine Explorer powered by Turner Sports, especially if you are playing fantasy golf.